Pro-level slideshow software with hundreds of ready-to-use templates, equally good for beginners and advanced users. Mix photos, videos, music, voice comments, and animated text to create spectacular multimedia presentations. Export to HD video or DVD. SmartSHOW 3D is a smart slideshow maker with professional capabilities. 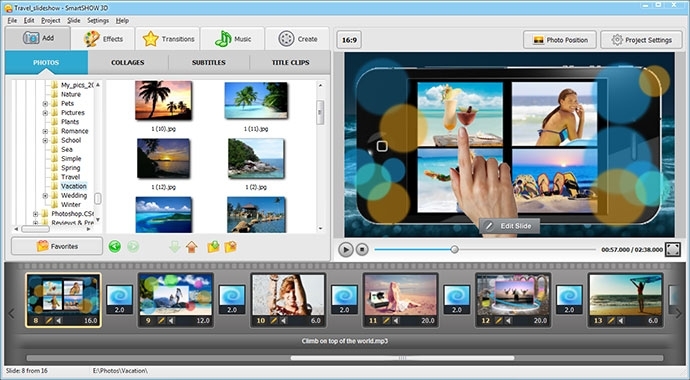 The software provides ample tools for creating animated slideshows with photos, videos, music and voice comments, transitions and subtitles. A huge collection of animated templates and 3D effects lets both professional and amateur photographers make brilliant photo movies. For a quick start, there is a slideshow creation wizard with dozens of ready-to-use slideshow themes. The user simply needs to choose a theme, add a folder with photos and a soundtrack - so, the slideshow will be ready in less than 5 minutes. The program allows for creating animated slides with multiple layers that can contain up to 10 photos, as well as video clips, text captions, various shapes and clipart. The user can fine-tune animation settings for every layer, and use the 3D camera effect for spectacular motion. 100+ original transitions and over 250 slide effects and animated collages can be combined to create hundreds of original slideshow projects. It is also possible to add several music tracks as well as voice comments and sound effects to certain slides. Slide effects like snow, falling leaves, bubbles, hearts, etc. deserve special attention. Based on an innovative 3D particles engine, they allow the user to achieve realistic look or create an original show. Same is true for new glow effects: fire, sparkles, glowing text and shapes. Slideshows created with SmartSHOW 3D can be burned to DVD with interactive menu or exported to 30+ common video formats in HD quality. A smart video conversion wizard will adapt the video for uploading it to YouTube or any popular gadget like iPad, iPhone, and various smartphones. The program also supports full HD 1080p output, i.e. the slideshow will look excellent on a large plasma screen. SmartSHOW 3D has a convenient interface with intuitive elements, which makes this professional-level software available to all users regardless of their experience.